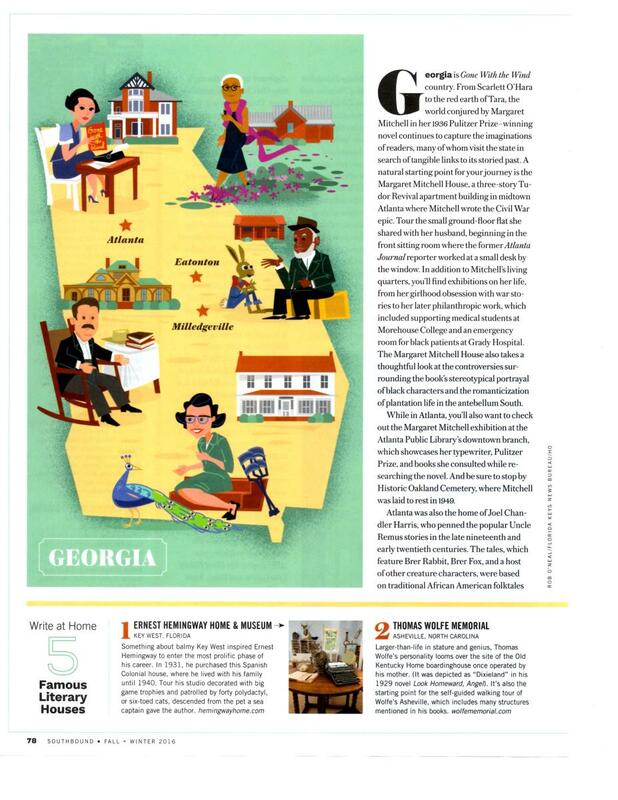 Article originally appeared in Southbound Magazine. 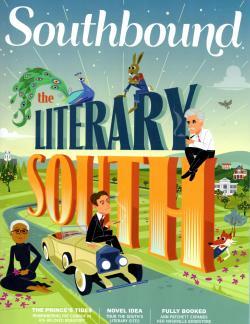 We explore the hometowns and historic sites that inspired some of the South&apos;s greatest writers. 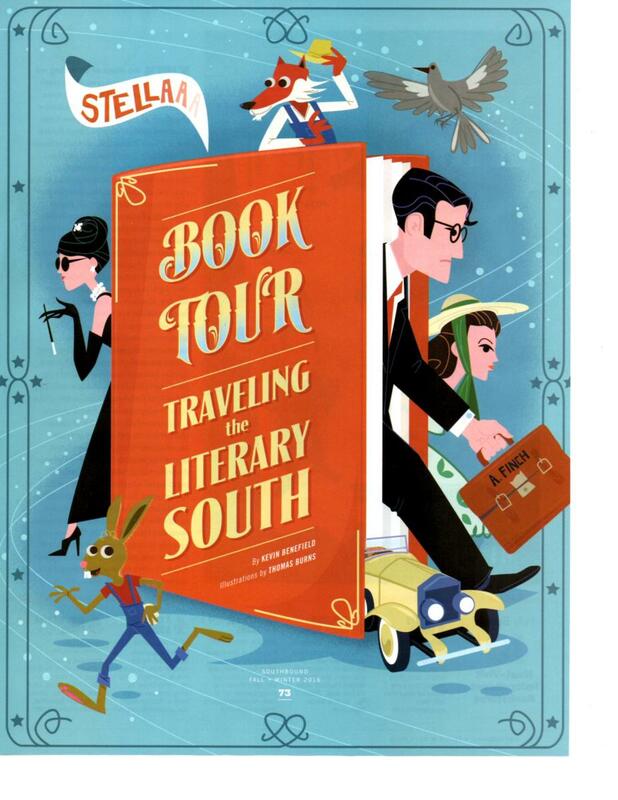 Discover the literary roots of William Faulkner, Eudora Welty, Joel Chandler Harris, Alice Walker, and more on this three-state tour. Georgia is Gone With the Wind country. From Scarlett O’Hara to the red earth of Tara, the world conjured byMargaret Mitchell in her 1936 Pulitzer Prize–winning novel continues to capture the imaginations of readers, many of whom visit the state in search of tangible links to its storied past. A natural starting point for your journey is the Margaret Mitchell House, a three-story Tudor Revival apartment building in midtown Atlantawhere Mitchell wrote the Civil War epic. Tour the small ground-floor flat she shared with her husband, beginning in the front sitting room where the formerAtlanta Journal reporter worked at a small desk by the window. In addition to Mitchell’s living quarters, you’ll find exhibitions on her life, from her girlhood obsession with war stories to her later philanthropic work, which included supporting medical students at Morehouse College and an emergency room for black patients at Grady Hospital. The Margaret Mitchell House also takes a thoughtful look at the controversies surrounding the book’s stereotypical portrayal of black characters and the romanticization of plantation life in the antebellum South. While in Atlanta, you’ll also want to check out the Margaret Mitchell exhibition at the Atlanta Public Library’s downtown branch, which showcases her typewriter, Pulitzer Prize, and books she consulted while researching the novel. And be sure to stop byHistoric Oakland Cemetery, where Mitchell was laid to rest in 1949. Atlanta was also the home of Joel Chandler Harris, who penned the popular Uncle Remus stories in the late nineteenth and early twentieth centuries. The tales, which feature Brer Rabbit, Brer Fox, and a host of other creature characters, were based on traditional African American folktales Harris heard from slaves when he was a boy. His 1870 southwest Atlanta home, the Wren’s Nest (named for the small bird that took up residence in the mailbox), is the city’s oldest house museum. On a guided tour of the Queen Anne Victorian home, you’ll learn more about Harris’s life, as well as African folklore traditions. You’ll also be treated to a glimpse of upper-middle-class life in turn-of-the-century Atlanta, as the original furnishings remain largely intact. Take a step further back in time on a visit to Harris’s birthplace of Eatonton, about an hour southeast of Atlanta. The plantation where Harris spent his teenage years no longer stands, but the stories live on at the town’s Uncle Remus Museum. Inside the log structure formed by the joining of two former slave cabins, you’ll find enchanting dioramas featuring Harris’s critters, as well as international editions of Uncle Remus books and antebellum artifacts. You’ll also learn about the two worlds the young Harris came to know: the fantastic realm of wily animals brought to life by slaves in their quarters and the brutal reality of slave life in the surrounding fields. African folklore also finds expression in the works of another Eatonton-born author, Alice Walker. Her best-known book, The Color Purple, won both the National Book Award for Fiction and the Pulitzer Prize (the first one awarded to an African American woman) in 1983. Set in rural Georgia during the first half of the twentieth century, the epistolary novel illuminates the lives of black women in the South. Pick up an Alice Walker Driving Tour map (available at the Plaza Arts Center) and head a few miles east of town to the countryside where she grew up. Purple signs mark significant sites, including the church in which she was baptized and the cemetery where her parents and other family members are buried. 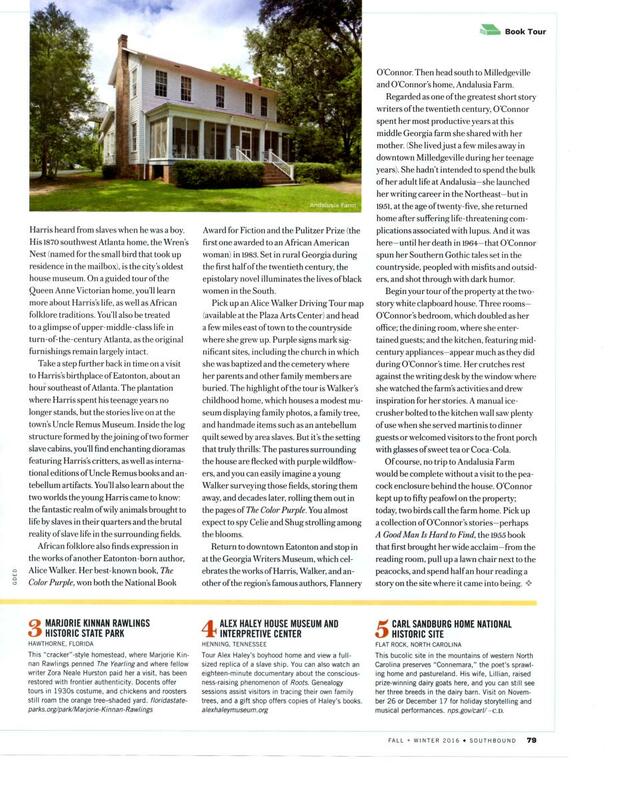 The highlight of the tour is Walker’s childhood home, which houses a modest museum displaying family photos, a family tree, and handmade items such as an antebellum quilt sewed by area slaves. But it’s the setting that truly thrills: The pastures surrounding the house are flecked with purple wildflowers, and you can easily imagine a young Walker surveying those fields, storing them away, and decades later, rolling them out in the pages of The Color Purple. You almost expect to spy Celie and Shug strolling among the blooms. Return to downtown Eatonton and stop in at the Georgia Writers Museum, which celebrates the works of Harris, Walker, and another of the region’s famous authors, Flannery O’Connor. Then head south to Milledgeville and O’Connor’s home, Andalusia Farm. Regarded as one of the greatest short story writers of the twentieth century, O’Connor spent her most productive years at this middle Georgia farm she shared with her mother. (She lived just a few miles away in downtown Milledgeville during her teenage years). She hadn’t intended to spend the bulk of her adult life at Andalusia—she launched her writing career in the Northeast—but in 1951, at the age of twenty-five, she returned home after suffering life-threatening complications associated with lupus. And it was here—until her death in 1964—that O’Connor spun her Southern Gothic tales set in the countryside, peopled with misfits and outsiders, and shot through with dark humor. Begin your tour of the property at the two-story white clapboard house. Three rooms—O’Connor’s bedroom, which doubled as her office; the dining room, where she entertained guests; and the kitchen, featuring mid-century appliances—appear much as they did during O’Connor’s time. Her crutches rest against the writing desk by the window where she watched the farm’s activities and drew inspiration for her stories. A manual ice-crusher bolted to the kitchen wall saw plenty of use when she served martinis to dinner guests or welcomed visitors to the front porch with glasses of sweet tea or Coca-Cola. Of course, no trip to Andalusia Farm would be complete without a visit to the peacock enclosure behind the house. O’Connor kept up to fifty peafowl on the property; today, two birds call the farm home. Pick up a collection of O’Connor’s stories—perhaps A Good Man Is Hard to Find, the 1955 book that first brought her wide acclaim—from the reading room, pull up a lawn chair next to the peacocks, and spend half an hour reading a story on the site where it came into being.